The ideal solution for flood restoration companies, abatement contractors, fire departments and municipalities. The Attix 19 AE Flood Sucker can collect and discharge one gallon per second and has a built-in, automatic discharge pump that operates simultaneously with the vacuum. It separates solids into a stainless-steel basket inside the canister while liquids are simultaneously discharged through a standard 1.5 inch fire hose (optional). The powerful discharge pump expels water up to 30 feet vertically and 150 feet horizontally. It can be operated in three modes—vacuum only, pump only, or vacuum and pump. Where ordinary sump pumps leave a level of one to one-and-a-half inches of liquid on the ground, the Flood Sucker removes liquids and brings surfaces to a completely dry stage. This unit is effective in helping flood-stricken customers clean and dry their flood-damaged carpets, floors, basements and more. 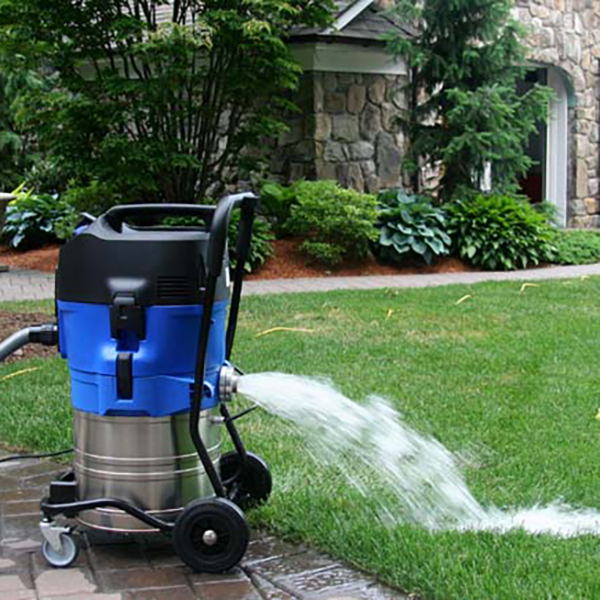 It cuts man hours by eliminating the time-consuming task of manually dumping the vacuum canister. A unique feature of the machine is the recovery container which can tilt or be lifted out, making emptying hassle free. This machine can be operated in three modes -- vacuum-only, pump-only (which allows you to trap liquids and pump them separately), or simultaneous vacuum and pump.